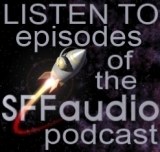 SFFaudio now has two more podcasts (!) – sort of anyway. First up is the new Ted Chiang podcast feed, which we previewed late last month (there’s new content in it). There’s also a new Poul Anderson podcast, which includes all the MP3 files from our Anderson AUTHOR PAGES. We’ll also be adding more feeds over the coming months.